One voice can still make a difference, and more than 180 board members and employees representing electric cooperative member-owners across Tennessee spoke with one voice during the 2014 Tennessee Electric Cooperative Association Legislative Conference in Nashville on Monday and Tuesday, Feb. 3 and 4. Attendees met with their legislators on Capitol Hill to help them better understand electric cooperatives and the issues that impact delivering safe, reliable and affordable power to their communities. Attendees reminded legislators that co-ops are not-for-profit, member-owned and -regulated private businesses. Legislators were told of the enormous impact co-ops have on their communities. Co-ops own and maintain more than $2.8 billion of infrastructure, including 86,000 miles of power lines, pay $63 million in taxes, employ more than 2,600 Tennesseans and have a payroll of $94 million. Tennessee’s electric co-ops kept the power on 99.96 percent of the time in 2013 and secured more than $4 million in economic development loans for their rural communities. Attendees also shared the results of a recent member satisfaction study. Tennessee co-op members are extremely pleased with the efforts of their local co-op, giving them high marks for satisfaction, trust and loyalty. 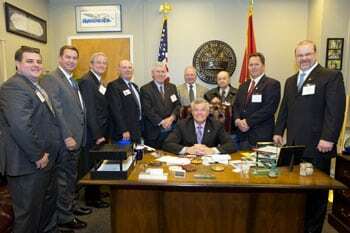 The primary issue discussed with legislators this year was a bill requiring all electric co-ops to join the Tennessee One-Call system, a company that provides services to utilities that own and operate underground infrastructure. While many Tennessee co-ops do participate, a few have virtually no underground utilities, so the service would provide little to no benefit. Co-ops believe that the local board should decide if the co-op should join One Call, not Nashville bureaucrats.